How educated are world leaders? infographic by almossawi. In democracies, the driver of change is typically elections; in autocracies, it is typically biology. It is often said that autocratic leaders are therefore less likely to be educated. Leaders’ education level has been found to be a positive predictor of, among other things, economic growth. 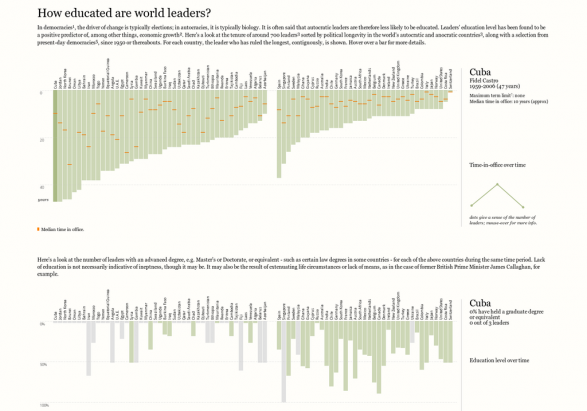 Here’s a look at the tenure of around 700 leaders sorted by political longevity in the world’s autocratic and anocratic countries, along with a selection from present-day democracies, since 1950 or thereabouts.